The objective of this project was to supply a weighbridge system for the existing quarries that are currently being operated by ArmStrongs. 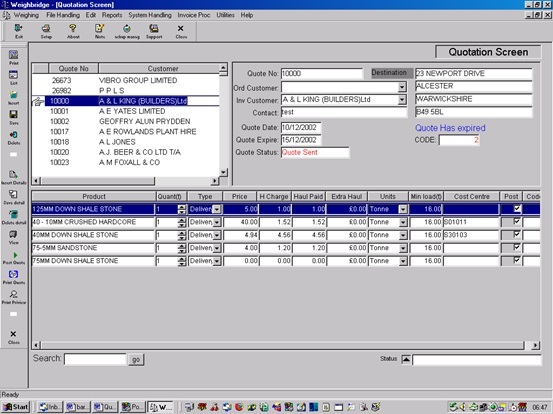 The quarry plants are remote from the administration office and the plan was to replicate the transaction data back to the administration office for automatic invoicing, together with providing each plant with customer credit information. 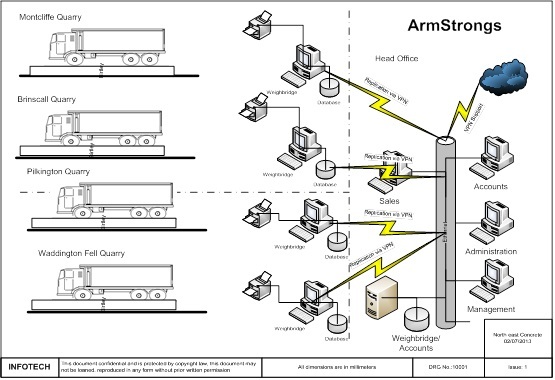 As you can see to the left there is a diagram of how the system is configured to manage the remote sites. A vehicle arrives and, if clear, proceed onto the weighbridge. The operator selects from either a search window or they can enter in the vehicle registration. All known data that has been entered in previously into the system will be retrieved. The operator is then prompted to enter in any missing data or unknown data, for example this could be the source or the waste type. Upon returning to the weighbridge after loading or unloading, the operator can either select or re-enter in the vehicle registration. 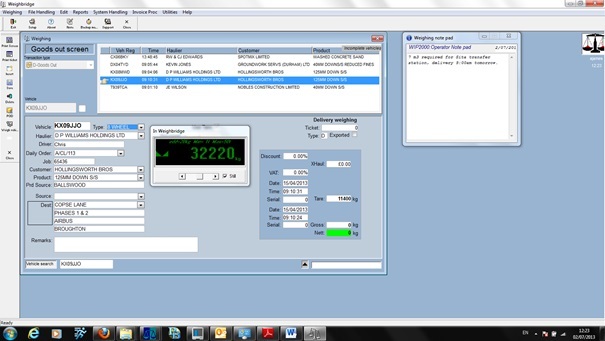 Then all of the previous data that has been entered will be retreived before the operator selects to weigh the vehicle. 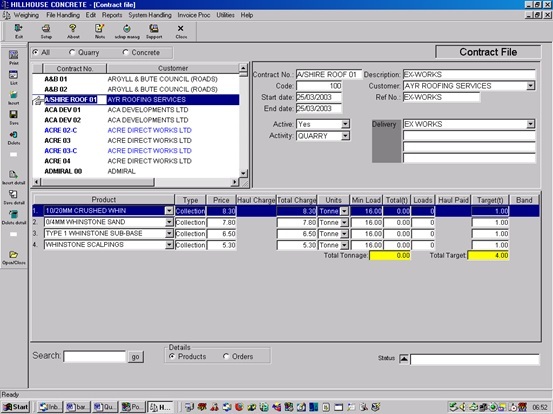 A final ticket is produced and the data is stored for invoicing. To the right are some sample screens of what the screens could look like. The weighing dialogue will not only manage the material that is entering and leaving the site, but will produce delivery notes and generate cash transaction charges. Advice notes are available for products along with completed transactions. Status - Clear indications abailable for use, lock prevents weighing. Discount - Default discount percentage. Account Ref. - This is the account code used within the accounts system. 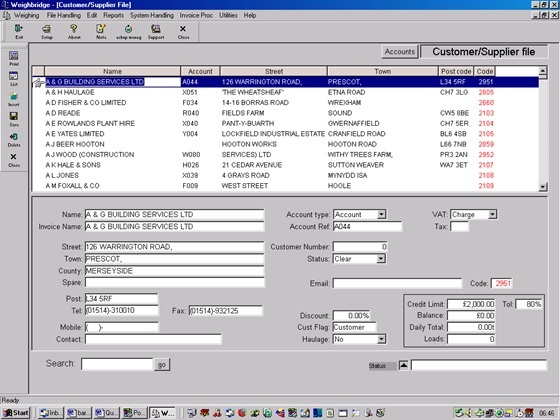 Credit Limit - This credit limit is uploaded from the accounts software and used within the weighing dialogue to calculate the account balance and includes transactions to be processed. VAT Charge - The account is charged or exempt from VAT. 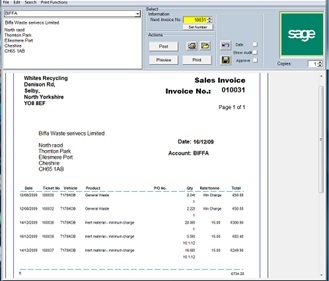 Customers can be created within the application, however to follow the natural flow of data it is considered better to enter the data into the accounts software and have the data including the balance and credit limit figures downloaded to the central weighbridge database server. To the left is a screen shot of what the screen may look like. A quotation can be created within the application for a product that can be collected or delivered from a specific quarry site. The status of the quote can be monitored and once accepted the quote can be posted to create or update a contract. To the right is a screen shot of what the screen can look like. 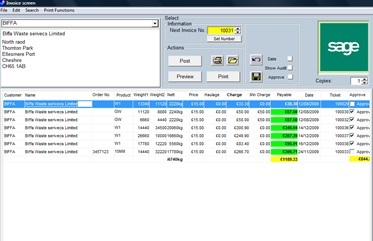 The contract file combines a product from a source to a destination including the product price, haulage costs and any spreading or driver payments where applicable. Daily orders are created in the contract file for a specific day. 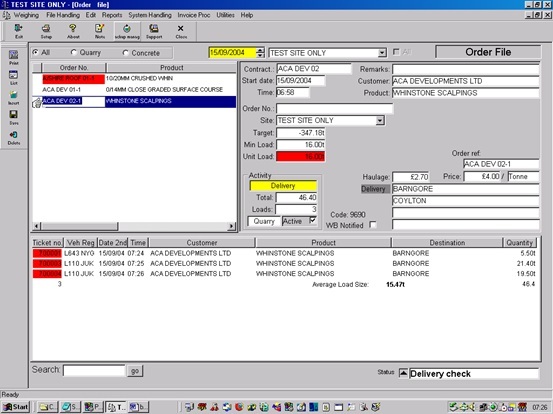 The daily order file monitors activities for the day; they also speed up the weighing transaction in that the order retrieves all of the known data. To the left are just a couple of images that would represent these screens.